Many house cleaning services offer set plans, and any additional rooms or services can quickly drive up the cost of having your home or office cleaned. Maid2Clean provides cleaning services that can be completely customized to fit the needs of your home or business in the Wilmington, NC area. Call us today and one of our experts will schedule a “Cleaning Diagnosis” to ensure that you get the best and most complete service!Maid 2 Clean is not your typical provider of Maid Services and Janitorial Services. If you are searching for that extra special touch with Cleaning Services or Commercial Cleaning Services, please give us a call today! We look forward to helping everyone save that extra little bit of time, allowing you to spend more time with your friends and family, and less time cleaning and scrubbing. At Maid2Clean, our dedicated professionals can help Bring Your Home Back to Beautiful! We provide house keeping, spring cleaning, Janitorial Services, and Commercial Cleaning Services to area individuals and businesses. Serving all of Southeastern North Carolina, we provide Maid Services and Cleaning Services in Wilmington, Brunswick County, Pender County, Wrightsville Beach, Carolina Beach, Hampstead, Topsail Island, Ocean Isle Beach, and many other surrounding areas. If you are looking for that extra special touch with cleaning Services or Commercial Cleaning Services, please give us a call today! We look forward to helping everyone save that extra little bit of time, allowing you to spend more time with your friends and family, and less time cleaning and scrubbing. At Maid 2 Clean, our dedicated professionals can help Bring Your Home Back to Beautiful! Our housekeeping services care available in Southport, Wilmington, and Hampstead, as well as the beach communities of Topsail Beach, Carolina Beach, Surf City, Bald Head Island, Figure Eight Island, Wrightsville Beach, Oak Island, Ocean Isle Beach, Holden Beach, Sunset Beach, and Kure Beach, along with coastal area real estate in Burgaw, Scotts Hill, Rocky Point, Hampstead, Leland, Bolivia, Brunswick, Calabash, Boiling Springs Lakes, Southport, Holly Ridge, Currie, Shallotte, Supply, and Sneads Ferry, we can make sure that all your cleaning services at met! If you have a budget we have a plan for you. Because we have no set plans you only pay for what you need. No job is to small or large. We have a team of professional cleaners that are dedicated to your needs. Our team is bonded and will arrive on time in a professional manner. 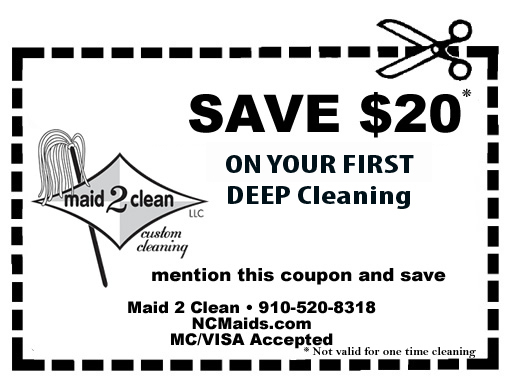 For the last 10 years, Maid 2 Clean has helped businesses in the Wilmington, NC area keep up their appearance. “After 10 yrs. of using housekeeping services, Maid2Clean is the most professional service we have found. Copyright 2019 Maid-2-Clean. All Rights Reserved.